The Perry family had (3) boys in our program last season. They lost their home yesterday in a fire. They were fortunate to make it out safely. Unfortunately, they have lost almost all of their possessions, and could use some immediate help from our community until insurance can help make them whole. CJT has made a donation on their behalf and we hope you will consider doing the same. The C-G HS golf outing is the biggest fundraiser for our high school team, and it is a great time! Save the date (Friday June 14th) and please consider putting together a foursome. CJT wishes to thank our members for your support. We are starting to see donations trickle in using Amazon Smile. Support Cary Jr Trojans by using Amazon Smile for your Amazon.com purchases. Use this link to set Cary Jr Trojans as your Amazon Smile charity, and Amazon will give 0.5% back from all purchases to our organization. Note: To use Amazon Smile, simply navigate to smile.amazon.com instead of amazon.com, and shop as usual. Amazon smile offers the same selection and prices as Amazon.com. Thank you to former CJT and CGHS alum, Ryan Mahoney for his company's diligent effort creating this great video. 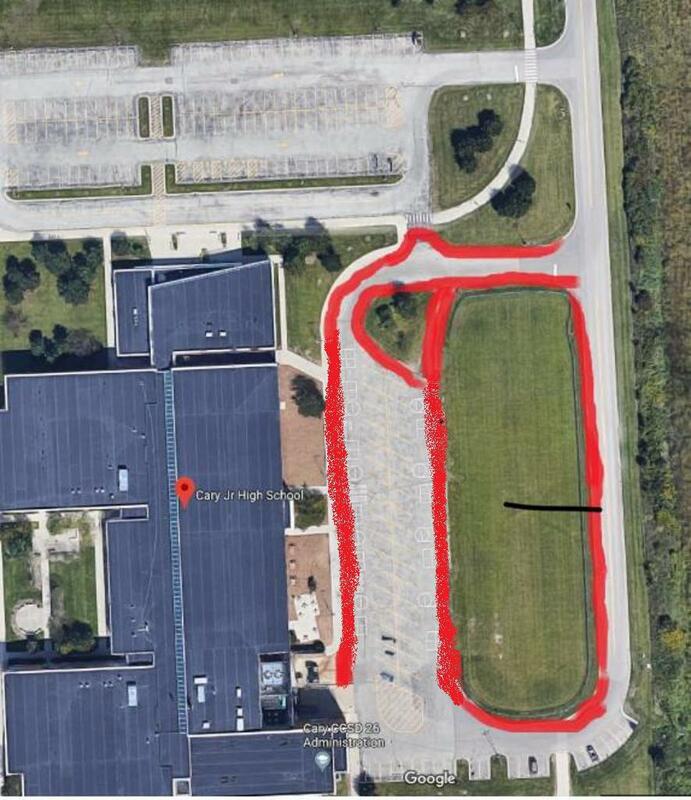 When parking at Cary Jr. High for football games, please park legally and NOT in the areas marked in red. You will be ticketed by the Cary Police Department for parking in a non designated spot. Fundraising coupon books on sale now at the concession stand for $25. They pay for themselves with the wide variety of coupons. Check out some of the coupons you get in the book below!!!!! Signup for 2018 Rainedout SMS notifications is open. All participants need to re-signup for the 2018 season, as the 2017 data has been purged. As of 08/02/2018, we are nearing 100% coverage for our football participants. Thank you for getting signed up so that we can contact you quickly in the event of a weather related cancellation. Thank you to Northwestern, North Shore, and TCYFL for hosting CJT Varsity Blue at Northwestern's Hutcheson practice field this past Sunday. It is an amazing facility, and our families had a wonderful time.